GENTRI: The Gentleman Trio consists of three trained tenors: Brad Robins, Casey Elliott, and Bradley Quinn Lever. The group from Salt Lake City was established in 2014 and has gained a solid fan base through their signature “cinematic pop” sound and luscious three-part harmonies. 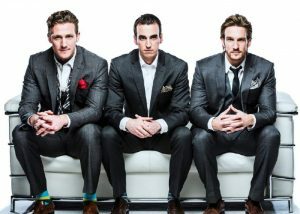 They were inspired by Josh Groban, Micheal Bubble, and Michael Bolton. Their mission statement to “bring gentlemen back” is inspired by on of Elliott’s female friends who shared that chivalry is dead in today’s dating society. The three met on the set of Les Miserables. The trio debuted with a self-titled EP in 2015. It was in the top ten of two different Billboard charts – Classical and Classical Crossover- for ten consecutive weeks. Their first music video release for the song “Dare” was featured on ABC World News, NBC Nightly News, and Inside Edition. GENTRI’s first full length album, titled RISE, included eight original songs and two covers. Critics enjoyed the debut, and it came out at #3 on the Billboard Classical Crossover chart. Since their formation, the gentleman trio has been able to perform with many well-known and famous artists around the world. Such artists include Idina Menzel, Alfie Boe, and the rock band Journey. You can learn more about GENTRI and their upcoming performances on their website.